Kullen-Koti has a large range of moulded brush discs. These are used for various applications, namely, de-burring. For this, brush discs with nylon abrasive filling or wire are mainly used. The abrasive filling removes burrs that occur during production processes. 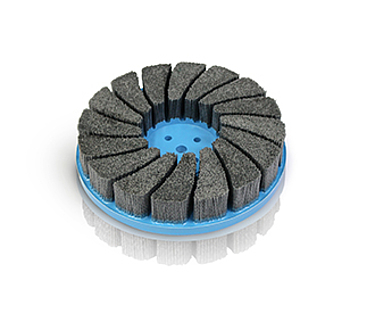 Moulded disc brushes are characterised by their filling density. This can´t be achieved with other brushes. Furthermore the moulded disc brush has an extra flat filling. That leads to perfect deburring results and has a longer service life than conventional brushes. They need to be replaced much less frequently. The brush discs are available in diverse dimensions and materials. They can be provided with a bore with or without a keyway. There are other connecting possibilities, such as nuts and cams. Besides abrasive filling and wire, all available filling materials can be used.